Has the time come to replace the garage door of your Leander, TX, home? If it has, then turn to the professionals at 31-W Insulation for attractive door options, expert installation, and service that will exceed your expectations. We have been installing garage doors since 1972, so you can rest assured we have the experience and know-how to do an incredible job. At 31-W Insulation, we are 100 percent committed to ensuring your satisfaction with every aspect of the garage door replacement process. We help you understand all of your options, so you can feel certain that you’ll find a door perfectly suited to your needs and unique taste. And, we only offer doors that are durable enough to stand up against heavy use, so you won’t have to worry about replacing yours any time soon. One of the best parts of having one of our garage door systems installed on your home is that you’ll get plenty of customization opportunities – you can choose your door’s color, window style, hardware accessories, and more to suit your tastes. 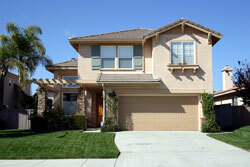 If you’d like, 31-W Insulation can help you with much more than just garage door installation. In fact, we are a one-stop-shop for nearly all of your home improvement needs. Contact us today to schedule a free consultation and learn more about how we can help set your Leander, TX, home apart from others in the area.